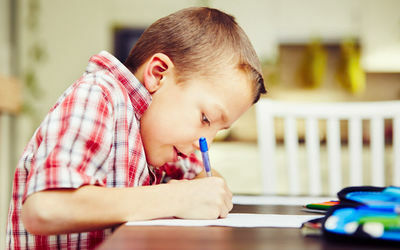 Kids with ADHD struggle with schoolwork. It takes concentration and time, which is something that kids with ADHD have a difficult time with no matter what they are doing. This is usually frustrating for parents as well. We want our kids to thrive in and out of school, but it’s not always easy when they are running in many different directions. Luckily, there are ways we can help our children work with the disorder that makes them struggle with schoolwork. Before helping children who have ADHD, it’s important to understand what it is and how it’s playing a part in our children’s learning. ADHD is a disorder within the brain that makes it difficult for children to pay attention. It causes them to be hyperactive and impulsive. The limited attention, impulsivity and hyperactivity is what makes it so hard for children to learn. If they can’t concentrate on a lesson for long enough to absorb it, they can’t apply it to do homework, do well on tests, and be successful academically. It’s the focus that is the biggest challenge when it comes to schoolwork, so that’s what should be what we need to work on to help our kids. The following are some of the ways we as parents can help our children absorb as much information as possible despite their ADHD symptoms. Distractions are not easily ignored by kids with ADHD. For this reason, we must limit them as much as possible. For example, speak to your child’s teacher about having seating arrangement and placing your child in a seat away from close friends, doors or windows. At home, the TV should be off, no siblings and friends should be around when completing homework, and pets should be placed outside or away from your child. Timers are an excellent way to keep our child attention on task before taking a break. Since children with ADHD have a limited attention span, start with 5 minutes of work and then a break. We should gradually increase the time as we see he or she can handle the extended time. Many of us like to feel as though we are being productive, it’s what motivates us to keep moving forward. The same goes for our children, even ones who are not suffering from ADHD. A good way to do this is to break up the work our children have to do into parts. For each assignment that is completed (the goal), our children should be praised. Praise is enough of a reward, but sometimes, we can give them something a bit more, especially when reaching the ultimate goal of completing all homework. While it may seem as though we have to always coach our children to complete schoolwork, it’s a great lesson for them to learn, so they can do it for themselves someday. Some children who suffer from ADHD grow up to become adults with ADHD, and these tips can help them at work someday. For those who have tried their hardest to help their children with ADHD, there’s always schools that specialize in helping kids with the disorder. This might be an option you want to consider.